Farm Aid celebrated its 28th year on Saturday, bringing the message of the Good Food Movement to Saratoga Performing Arts Center. I attended last year's festival in Hershey, so the nestled-in-the-woods amphitheater was a picturesque departure from the concrete stadium in Pennsylvania. The narrow sloped section of the lawn was filled by the time I entered the venue around 12:45. The terrain plateaus after that, so fans whose sightlines weren't already blocked by the long ramps leading up to the imposing balcony, had to rely completely on the large video screens. My advice is to arrive at SPAC early if you have a lawn ticket because it's clear the sacrifice has been made for the one-of-a-kind pavilion. After checking in at the press tent, I made my way over to the Homegrown Village, where I caught a couple songs by Will Dailey, who I'd seen at Bowery Electric a few days prior. He closed his set with "Sprawl II (Mountains Beyond Mountains)," a fitting choice considering New York is losing one farm every 3.5 days to suburban sprawl. The Village itself had considerably improved from last year. In addition to organic food options and a local beer/wine/cider tent, the exhibits were also more interesting, like an infographic made of an actual apple sliced up into smaller and smaller pieces to finally represent the tiny bit of the earth's topsoil that's viable for farming. I got one of the porkchop sandwiches I'd wanted to try last year (which turned out to be disappointingly dry), and sat down to watch a panel consisting of Amos Lee, the director of King Corn, and a 17-year-old Future Farmer of America member. While it was a nice talk, I was there because I'd hoped to get a podcast interview with Amos, and the briefings were required for those looking to do so. Missing Bahamas' set in the process, I was especially bummed to learn that no reporter (at least the ones I talked to) acquired an artist interview. I returned to the pavilion for Lukas Nelson & Promise of the Real. They kicked off their set with "Four Letter Word" like they did last year, but Lukas was a notably stronger performer this go-round. With more muscle in his voice to match his accomplished fretwork, it was apparent that he's been working hard to live up to his title of "the future of Farm Aid." He also logged the most total stagetime as he sat in on sets throughout the concert. 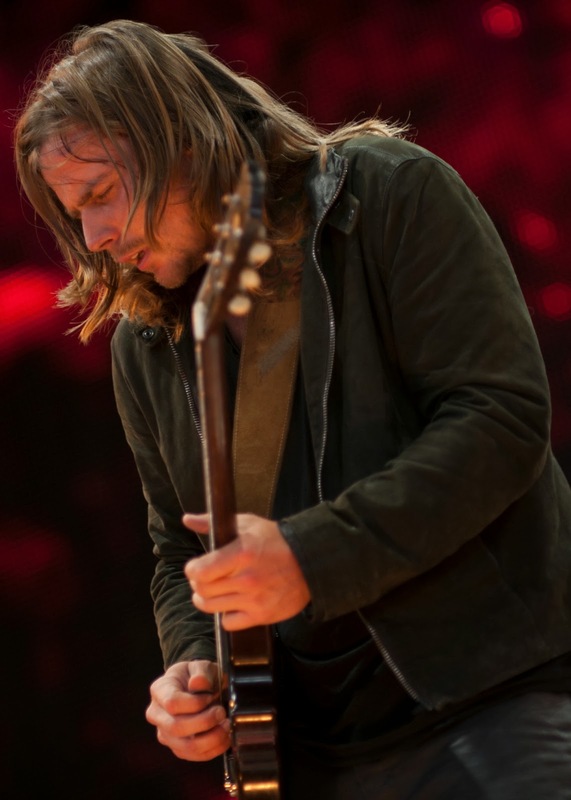 Originally composed for the father-daughter dance at a friend's wedding, Lukas dedicated the sweet "I'm Giving You Away" to Neil Young's recently-wed daughter, and topped off "Don't Take Me Back" by gnashing at his guitar strings with his teeth. Before he departed, Nelson iterated Farm Aid's mission to support family farms, but also suggested, "Grow your own food. If you have a backyard, put some food in it." Mickey Raphael returned to accompany Amos Lee on "El Camino," though Willie remained conspicuously absent, despite his cameo on Lee's Mission Bell LP. Perhaps even more shocking, however, was the lack of new tunes from Amos' upcoming album, Mountains of Sorrow, Rivers of Song. "I'm just gonna sing whatever, alright? So this is a song called 'Skipping Stone,'" he said. 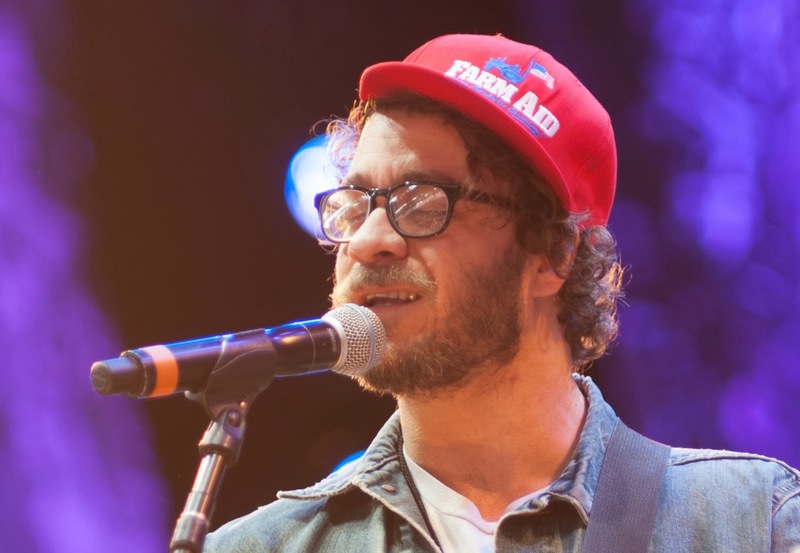 With his red Farm Aid cap cocked to the side, Amos went solo for rest of his soulful set. Though his powerful voice usually eclipsed it, a loud hum from the speakers was unfortunately noticeable during the quiet moments of the performance. And while I never mind it when an artist covers Sam Cooke, must it always be "A Change is Gonna Come?" At just twenty minutes, it was an all-too-brief slot for one of my most anticipated acts of the day. I skipped out on the country singers to charge my phone and catch the aforementioned Toad panel, but I returned to my seat just in time for Jack Johnson. After luring in the crowd with old favorites "Better Together" and "Sitting, Waiting, Wishing," Johnson used new single "Radiate" to unveil the most psychedelic jam I've heard from him, striking his electric guitar with his palm to create sonic shockwaves. Zach Gill teetered on top of his piano stool to play melodica on "Bubble Toes," and then descended to throw a dash of accordion into the "Banana Pancakes" mix. A little bit of Lebo must've rubbed off on Gill, who supplied some lap steel to "Shot Reverse Shot," while in the control room, an overzealous director cheesily switched between camera angles on the beat. My personal highlight of the night came next, when Lukas Nelson checked in to weave some electric layers into "Flake." Nelson stuck around to inject a few blues licks into "Staple It Together," which also featured a rap from Merlo. "At or with Me" plunged headfirst into a boogie-woogie piano version of "Crosstown Traffic" and resurfaced to finish with a crowd-chant coda. "I love this building. 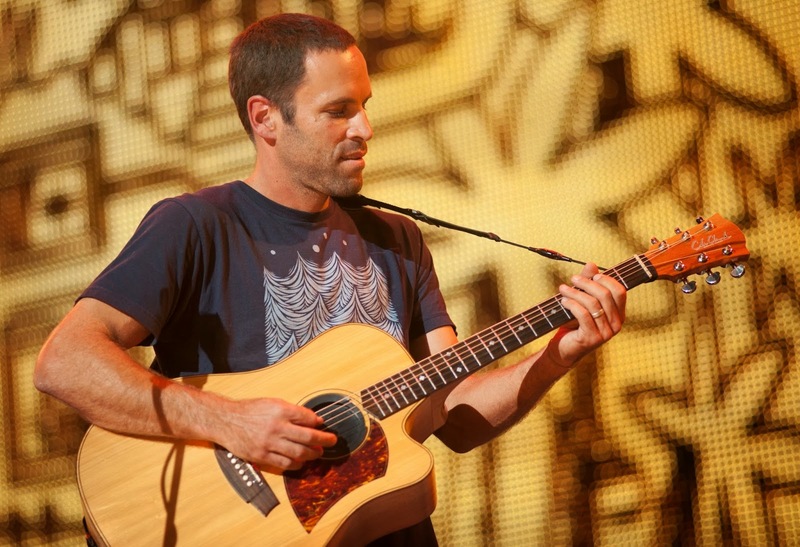 It's nice to be here tonight," offered Dave Matthews, sitting down on a stool next to Tim Reynolds. The acoustic twosome launched into an extended intro to "Save Me," which culminated in a series of falsetto yelps from Dave. Reynolds was the star on "So Damn Lucky," using his slide to alternate between vicious squeaks and brittle cascades. "I like the room. I like this roof. I like the seats. I like those seats. 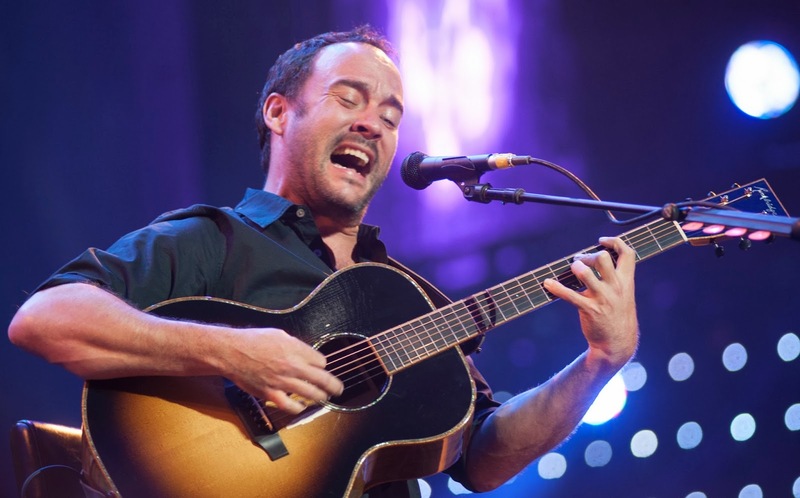 I get to play something that I love in a place that I love," said Dave before firing up a hot slice of "Corn Bread." TR killed it on this one too, whether using his thumb to make percussive noises on the body, or shredding high notes with such intensity that his fingertips nearly met over the sound hole. After sharing the tale of the tune's genesis on his front porch, Matthews eased into "If Only." My favorite submission to the 46-minute set, the lovelorn anguish just leapt off of Dave's face during the tune. "Thank you very much. We've never played that song just the two of us," he said before adding in a silly gruff voice, "That don't matter! Just tryin' to make music." The sky now dark enough to fully appreciate SPAC's excellent lighting design, the dynamic duo were bathed in green for "#41" before wrapping things up with fan-favorite "Two Step," Dave and Tim furiously strumming as they fed off the crowd. "When Willie was creating the first Farm Aid, the first person he called was John Mellencamp," shared Matthews. I guess I grew up in the wrong part of the country to fully appreciate Mellencamp's heartland rock because while the majority of the audience was lapping up "Authority Song," I found myself getting bored. The gum-chewing Mellencamp followed it with "No One Cares About Me." (Joke is too easy here. I'll pass.) John's band left him alone for an acoustic "Jack & Diane," although alone is a bit of an understatement, considering the entire pavilion was singing along, including the caterwauling drunk lady behind me. The set reached its apex when Mellencamp tossed to the crowd completely for the "let it rock" section. "Alright, you guys wanna hear a new song or an old one?" he questioned. "Old!" demanded SPAC. "I have a lot of old songs. Let's do this one then," he said, beginning "Small Town." "It's the same chords as the last one!" he laughed. At least he knows. Towards its end, he was joined by Miriam Sturm on fiddle and Troye Kinnett on squeezebox, with the musicians appending an instrumental take on "The Old Rugged Cross." The remainder of the set played out exactly the same as last year, finishing with "Pink Houses." After basking in two minutes of cheers and whistles, Mellencamp admitted that he copied Woody Guthrie for that song. It was all a setup for the surprise introduction of 94-year-old Pete Seeger, who slowly shuffled to the center of the stage with his banjo. Seeger literally led the crowd on a singalong of "The Hammer Song," prepping everyone by shouting out the first part of each impending line. 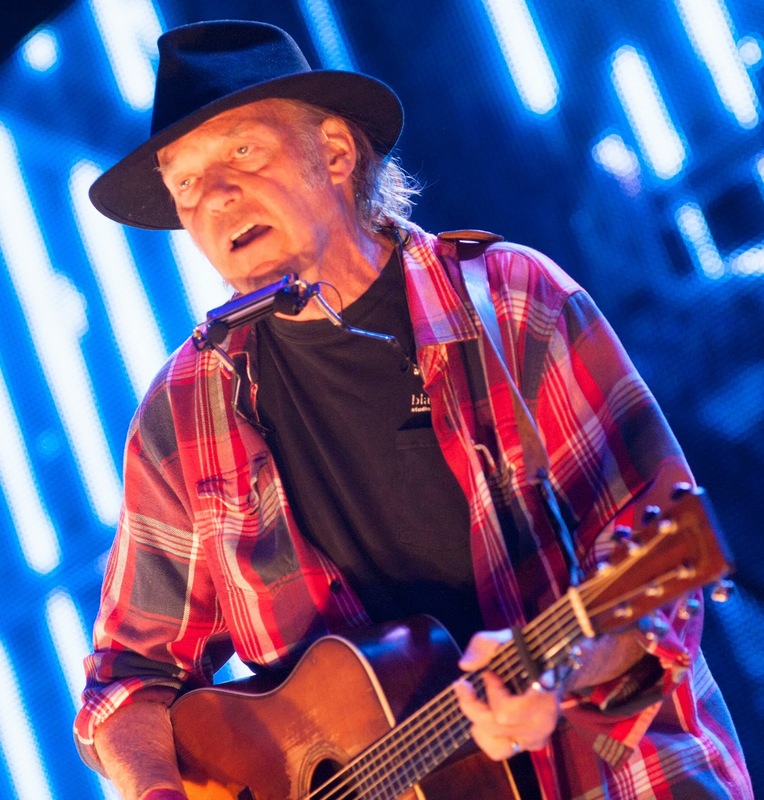 He welcomed the Farm Aid board members to help sing Guthrie's "This Land is Your Land," which included the lost "private property" verse, as well as a new one tailored to New York, ending with the line: "New York was meant to be frack-free." Aside from the glowing Seeger, Neil Young appeared to be having the most fun as he joyfully leaned into the microphone with a huge grin on his face. After an endorsement from Mellencamp as the world's greatest songwriter, Neil Young chose to start his set with two Dylan songs, "Blowin' in the Wind" and "Early Morning Rain." 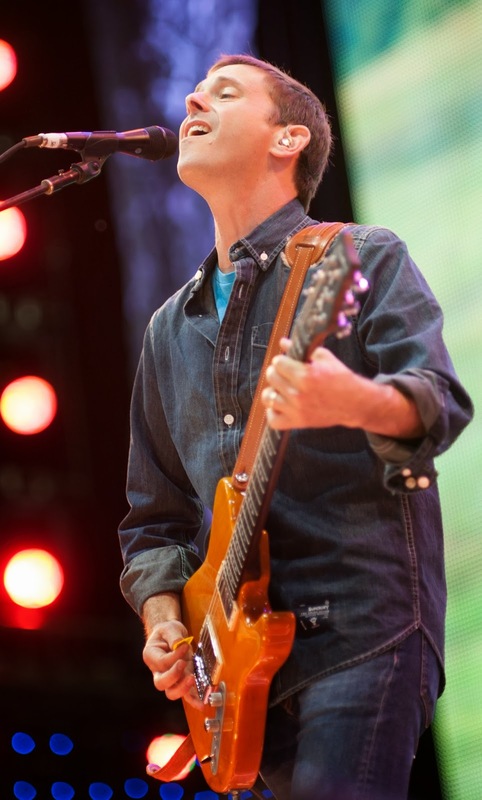 In fact, Neil performed very little of his own catalogue, just a pair of Harvest tracks, "Old Man" and "Heart of Gold." Between songs, Neil spoke through the mic on his harmonica rack, turning the performance into a bizarre TED Talk as he paced the stage, railing against industrialized farming and big oil. "All the carbon that's up in the sky used to be down here in the soil!" he exclaimed, blaming corrupt politicians and chemical manufacturers like Monsanto. "I don't really know what I'm gonna do now," he said, punctuated with a sad harmonica exhale. Young went to the piano for "Since I Met You Baby," turning to face the crowd once he'd finished. "What the hell's he gonna say now?" he joked, playing the role of a ticketholder. "There's a lot of things I could say," he said solemnly, and sat down at the pipe organ. "Let me remember this song," said Neil as he began to plunk out the chords to Tim Hardin's "Reason to Believe." He aborted it quickly to go on another tirade: "Wouldn't you like to burn something clean instead of something dirty?" He attacked Washington for their reluctance to enact biofuel legislation. "They would mandate it if they had the balls! That's what Farm Aid's all about. Some of it's not that much fun to hear about," he declared. "I think I feel better now. I'm gonna try again." He returned to the organ to restart "Reason," which was especially heartbreaking in Neil's voice, having grown so accustomed to Rod Stewart's. Young rose to his feet, strapped on his guitar, and began to tell another story before being interrupted by a spectator. "Come on, let's go? Did I hear 'Come on, let's go?' I'm on my way, buddy. I work for me," Neil said defiantly. He continued on with his account of Phil Ochs' tragic suicide. "He wrote this song, which some of you have probably never heard of, and it's long as hell," he said, performing "Changes" in tribute to "one of the greatest songwriters who ever lived." It was unclear as to whether it was just the show running over, or his irritation with the disrespectful members of the crowd, but Neil didn't stand around long to absorb the applause, wrapping up his time at a slim forty minutes. Farm Aid always seems to run late, and in my opinion, the board member video introductions should be first on the chopping block. It's exciting enough to see Neil Young introduce Nelson that I'd rather hear "On the Road Again" than spend three minutes watching the same montage as last year. This year they tacked on another video in celebration of Willie's 80th birthday, which included wishes from Grace Potter, Band of Horses, and a bunch of family farmers. The birthday piece itself could've done the trick. It goes without saying that Willie & the Family began with "Whiskey River." After "Still is Still Moving," Nelson brought out Lily Meola to join him on "Will You Remember Mine," the set's sole entry from his soon-to-be-released To All the Girls, an album of duets with female songbirds ranging from Mavis Staples to Norah Jones. 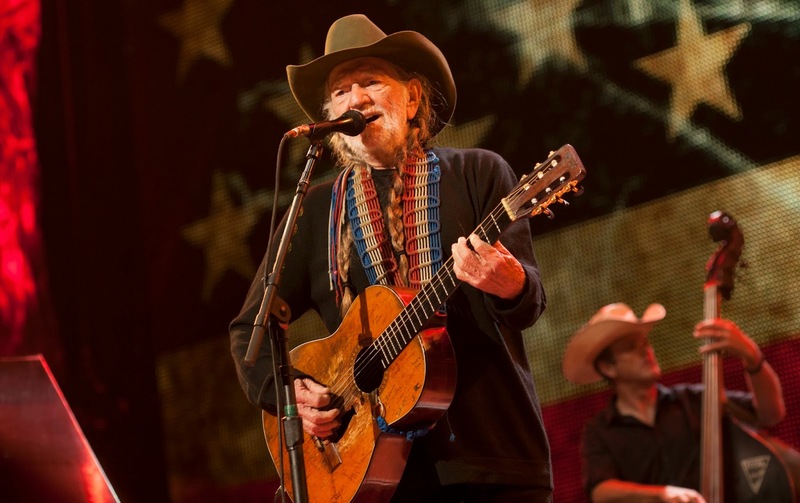 For both "Good Hearted Woman" and "Mammas Don't Let Your Babies Grow Up to Be Cowboys," Willie raised his hand behind his ear to roust the crowd to sing each chorus. 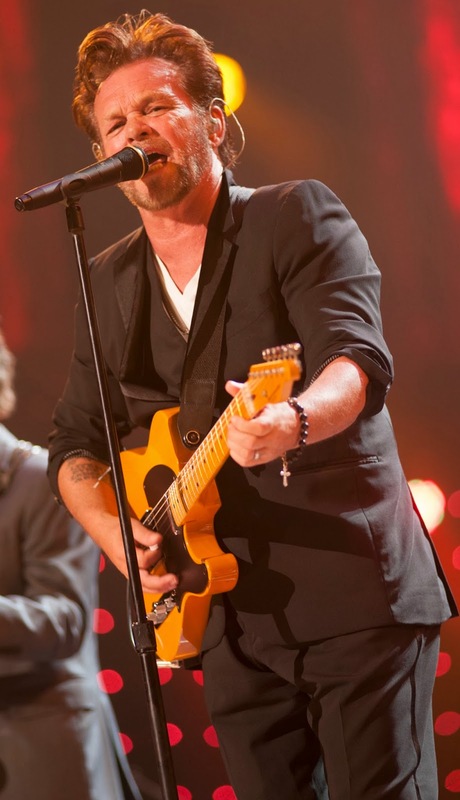 "Just Breathe" toned things down a little, and then Lukas took lead vocals on the bluesy "Texas Flood." As the Nelsons sang of the flooding down in Texas, a deluge soaked the crowd on the lawn, leaving only the poncho-covered diehards and protected pavilion patrons behind. Bobbie Nelson took the remaining fans on a ride "Down Yonder," while Willie removed his hat and tied on a red bandana. After three more tunes, the day's musicians crowded the stage for an all-sing of "Roll Me Up" and "I Saw the Light," bringing Farm Aid 2013 to its soggy conclusion. Hey, at least it's good for the crops.